Ryan O'Reilly and the Blues open a three-game road trip Wednesday night in Chicago. CHICAGO — The St. Louis Blues again will play without center Brayden Schenn when they open a three-game road trip at Chicago on Wednesday night. Blues coach Mike Yeo told reporters Tuesday that Schenn (upper body injury) won’t play against the Blackhawks but could return to the ice sometime during the road trip. Schenn has missed the Blues’ last three games. The Blues begin a stretch of three games in four days with games at Las Vegas and San Jose following the visit to Chicago. 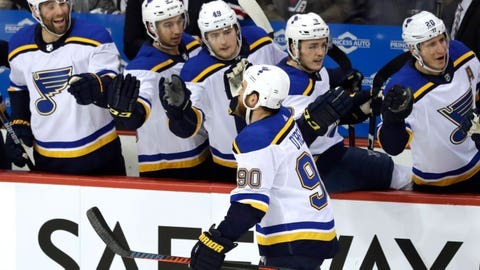 St. Louis has won four of its past six games but is coming off a 3-2 loss to the Minnesota Wild on Sunday. The Blackhawks, meanwhile, are trying to get on track after a poor start led to the firing of coach Joel Quenneville last week. When Jeremy Colliton was handed the Blackhawks’ reins last week, he understood there wouldn’t be any quick turnarounds. That hasn’t changed in the three games — all losses — Colliton has spent behind the Chicago bench. All told, the Blackhawks have lost eight straight. While the frustration remains present throughout the roster, the patience that Colliton is being forced to exhibit must also trickle down to his players. Chicago’s latest loss came after the Blackhawks built a 2-0 advantage — their first lead in a game under Collison. But as they have experienced many times this season, they were unable to put a team away and again couldn’t figure out how to win. The Blackhawks placed forward Marcus Kruger on injured reserve Tuesday with a left leg injury and called up defenseman Gustav Forsling, who underwent wrist surgery in the summer and has started the season with the Blackhawks’ AHL affiliate. Kruger is eligible to return Friday, but the Blackhawks will get Brandon Saad back Wednesday. He missed the past two games after he was hit on the arm by a puck last week in practice. Saad, like many of his teammates, has been intent on watching video as the Blackhawks hope to adjust to Colliton’s system.